A valve sizing program for control valve manufacturers, customised to your requirements. We will brand our control valve sizing and selection software to your company, put your products into the menus, and put the technical details of your valves and actuators into the calculations. The program will then work for you to help your employees and agents rapidly produce accurate quotations with detailed specification sheets and prices, respond quickly to enquiries, and impress your customers. Developed and refined for many years by Millstream Software our valve sizing program is designed specifically for control valve manufacturers to size and select their own range of control valves and actuators, and efficiently produce accurate quotations. We will modify the program to meet your requirements, for example by creating specification sheets in your preferred format or by adding your own trim calculations. The program is in live use at several prestigious valve manufacturing companies, and hundreds of detailed improvements have been made to the program in response to their feedback. Millstream Software will be continuing this process of incremental improvements to maximise your employee efficiency and to support your new business and engineering requirements. Quotations output as PDF files, or Excel spreadsheets, ready to email or print. Including specification sheets, prices, drawings and characteristic curves as required. In your own custom format with your logo and contact details. Valve capacity, noise and cavitation calculated to international IEC standards. Calculation of liquids, gases, choking, vapour pressure, velocity, density etc. 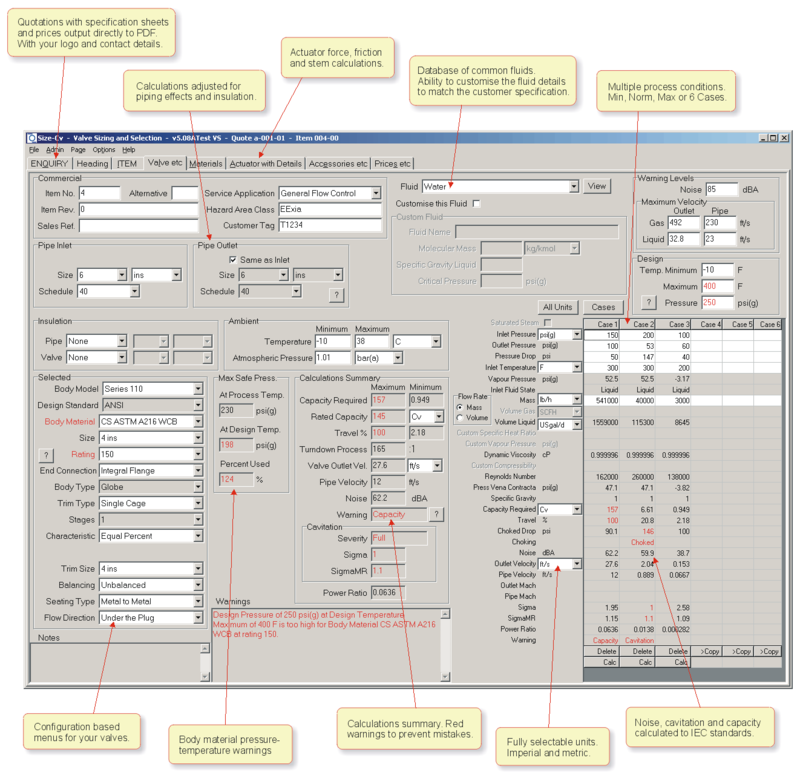 Detailed calculation trace available for engineering and audit purposes. Integrated product configuration features for rapid and accurate selection from complex ranges of valve and actuator sizes, trims and materials. Prevent selection of inappropriate combinations and preselect common components and materials. Simple calculation summary with red warnings to prevent sizing and selection mistakes. Material pressure-temperature warnings. Fluids properties table contains many common fluids. The ability to customise fluid factors such as vapour pressure to match a particular customer specification. Fully user-selected units for all dimensions. Quickly switch all units between Imperial and metric. Multiple process conditions. Easily switch from 6 numbered cases to Min, Norm, Max and Other. Stores quotations and process conditions for later revision. Compatible with all versions of Windows from 2000, XP, Vista, 7 etc. Last updated 21st September 2012. Copyright © Millstream Software. All rights reserved.